Wizard Dojo – Page 111 – A wizard is never late, nor is he early. He reviews stuff precisely when he means to. The Boxtrolls is another offbeat stop-motion endeavor from Laika Studios, who previously created Coraline and ParaNorman. Boxtrolls is a bit more charming and less dark than its predecessors, but it retains their expert craftsmanship. 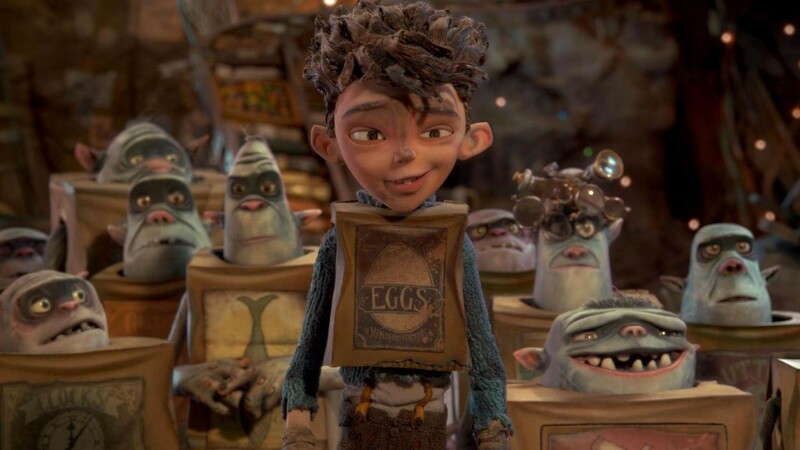 In case the title of “The Boxtrolls” wasn’t offbeat enough, the hero of the movie is named Eggs. 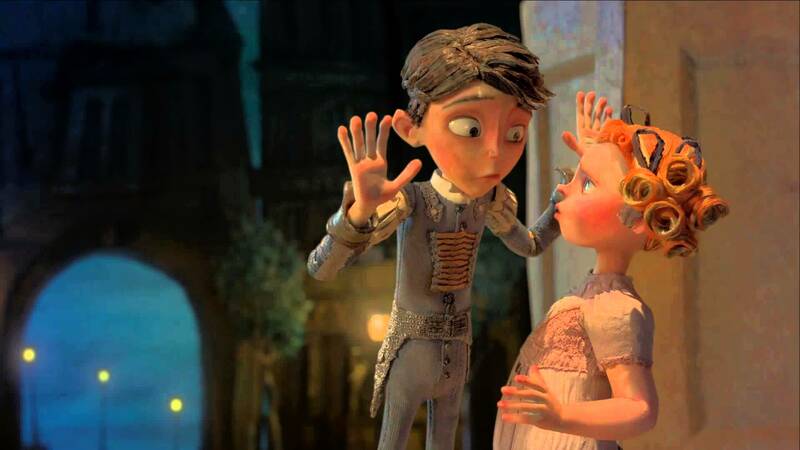 Eggs is a human boy raised by the Boxtrolls after he was orphaned. 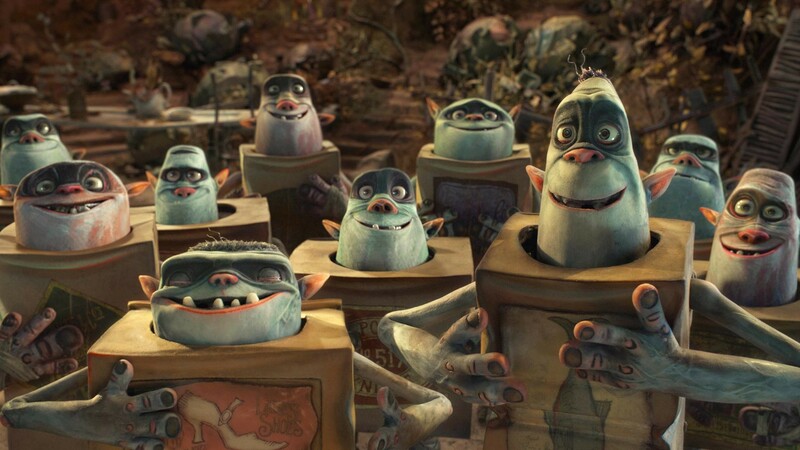 The Boxtrolls are strange little creatures that take up names based on the cardboard boxes they wear (Eggs wears a box labeled ‘eggs’ hence his name). They sleep underground during the day, and dig through garbage for metal trinkets at night. They are harmless creatures, and too cowardly to fight back should anyone try to do them harm (hiding in their boxes is their only method of self-defense). Despite their simple nature, the people of the town of Cheesebridge all fear Boxtrolls, believing that they kidnapped and ate the orphaned boy years earlier. A ruthless exterminator, Archibald Snatcher, claims that he can rid the town of the creatures. In return, Snatcher wishes for the town’s mayor to grant him membership into the White Hats, the town’s council of aristocratic cheese connoisseurs (despite Snatcher having a cheese allergy). One by one Snatcher and his team of thugs begin to exterminate the Boxtrolls, until only a few of them (and Eggs) remain. It’s then up to Eggs and the mayor’s daughter Winnie to find a way to save the defenseless creatures. It’s a simple storyline that packs a fair bit of charm due to its sillier aspects and some fun humor (the scenes where Eggs attempts to fit into human society – only for his trollish upbringing to get in the way – are among the film’s highlights), but it’s the animation that’s the real star. The character models are wonderfully realized caricatures, and they move with a liveliness to match that of a CG animation. Oftentimes there’s so much going on all at once that you really do wonder how the film was made. Stop-motion animation is always a work of painstaking patience and attention to detail, and The Boxtrolls is one of the best examples of how well it can all payoff. Unfortunately, The Boxtrolls isn’t always so wonderful as its animation. Too often it falls back on gross-out gags (namely those relating to Snatcher’s cheese allergy), which never mesh with the movie’s otherwise good nature. And as has been the case with Laika’s past films, the message, while telling simple truths, becomes a bit loud. Being kind and understanding to those who are different than oneself is definitely a good message, but it’s also recycled from ParaNorman, and both films seem to have a need to bluntly reinforce it, which can make things feel a tad contrived at times. Still, the good ultimately outweighs the bad, and it would be hard for someone to be completely bored with a movie that looks so alive. The Boxtrolls boasts some of the most detailed stop-motion I’ve seen, and makes it look effortless. And when it’s wise enough to leave the gross-outs behind it, it can be a funny and smartly-written film (another highlight are snatcher’s minions, a group of simpletons who think they’re doing the right thing, but slowly begin to realize they are little more than evil henchmen). The Boxtrolls may not always work, but it would be impossible to not be won over to some degree by the work that went into it. Although the original Animal Crossing remains an engaging and addicting gaming experience, it’s DS and Wii sequels, while solid enough, lacked any meaningful changes to the series. It became a wonder if Animal Crossing was doomed to complete repetition. Then along came Animal Crossing: New Leaf on the 3DS, and suddenly the series once again became one of Nintendo’s secret weapons. Rest assured that the “New” in the game’s title is appropriate. 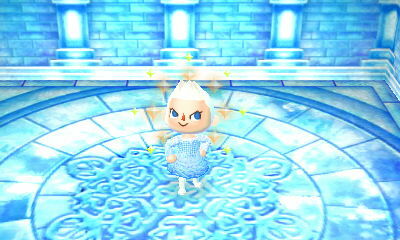 New Leaf represents the first leap forward for the series, after the the previous entries seemed content with merely replicating the original. It isn’t necessarily a complete reinvention of the series, but New Leaf adds enough meaningful changes to the formula to make it a memorable and engrossing experience that demands replayability. Yes, you still collect bugs, fish and fossils. You still greet your absurd animal neighbors, and you still scrounge around town looking for enough bells (the game’s currency) to pay off your house to Tom Nook. But now you do so with a more personal control of your town. 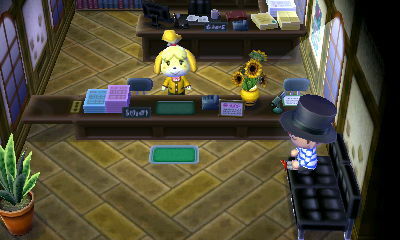 As soon as you name your character and town, you become the new mayor of the place. As such, you can now help shape the town itself, instead of merely being a part of it. In a more literal sense you can commence construction on various public work projects (bridges, police stations, etc. ), which can be placed pretty much anywhere you choose. And in a more figurative sense, you can commission ordinances for how your town operates. Maybe you want your shops to open extra early, or perhaps you want them to stay open into the wee hours of the night? Or you just want to be able to sell things for a higher price? 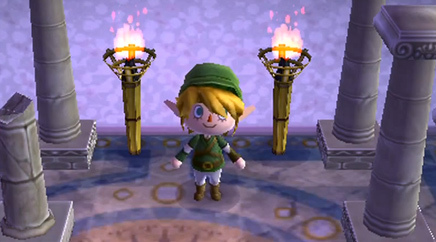 New Leaf provides plenty of options for you to run your town. Additional changes include the ability to swim and scuba dive (meaning there’s all new kinds of undersea life to catch), more character customization options, various new events that occur around town (quite frequently), and you can now visit your tropical island at any time starting early in the game (no attached gimmicks to gaining access to the island this time around). Said island now features a range of mini-games for a bit of added variety. It may not sound like much, but the thing that makes New Leaf such a standout is that these little touches just keep coming at you. One day your entire town will be scavenging for bugs, the next day you’ll be invited to one of your resident’s homes for a little get-together. You’ll commission a cleanup of the town’s litter one minute, then take part in a game of hide-and-seek after that. The best part is you do things however you want. Whatever the game throws at you, whether it be a festival or a town get-together, you can just go about things at your own pace. There’s no pressure to do any one thing. You can even go to the beach and catch some fish, avoiding the hustle and bustle of the town’s goings-on altogether. Animal Crossing has always been a rare stress-free experience in gaming, and the new additions to New Leaf make at an even greater “play it your own way” type of game. You can literally play for fifteen minutes or five hours if you want, and you’ll get a lot done either way. The simple sense of accomplishment that is so often found in this game becomes an accomplishment in itself. 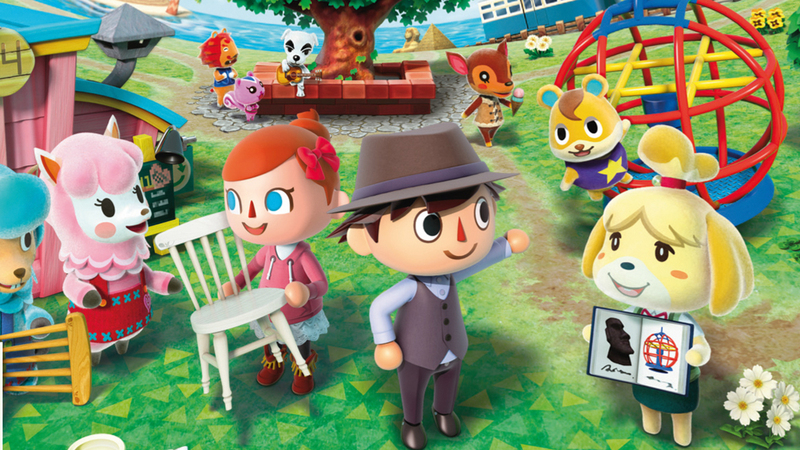 New Leaf, more than any Animal Crossing before it, is also built with multiplayer in mind. You can visit your friends’ towns (or they could visit yours. Just keep your place nice and tidy) and do whatever you want. You can trade items, share your customized t-shirt designs, plant trees to make the local fruits of your town a new local fruit of your friend’s, or just go to a cafe for a cup of joe. The 3DS’ smoother online capabilities over those of the DS and Wii versions make this the most enjoyable Animal Crossing to play with a friend. If you’re an Animal Crossing fan but felt that the sequels were too derivative, New Leaf brings enough newness to the table to make you remember why you love the series to begin with. If you’re new to Animal Crossing, New Leaf is a great way to introduce you to the series (not that this is a series that would overwhelm anyone very easily), and it retains everything that made the series so addicting to begin with. There are some small quibbles that have continued since the series’ beginnings: the game is insistent on making you collect furniture and trinkets for your house, yet most of such trinkets aren’t interactive in themselves, leaving you to wonder why you spent so much money on them to begin with. And Tom Nook’s demands for your Bells can get quite hefty, which can leave you spending entire play sessions scrounging for Bells, should you wish to pay the conniving raccoon and improve your house. But these really are small complaints when the overall package is so delightful. You may just find yourself checking into your town on a daily basis for no other reason than to just check in on its progress. It’s an addictive game, but in a rare case where it’s addicting for being inviting, not demanding. There’s always something to see and do, the experience itself is a reward. It may have took twelve years, but Luigi’s Mansion did eventually receive a sequel. 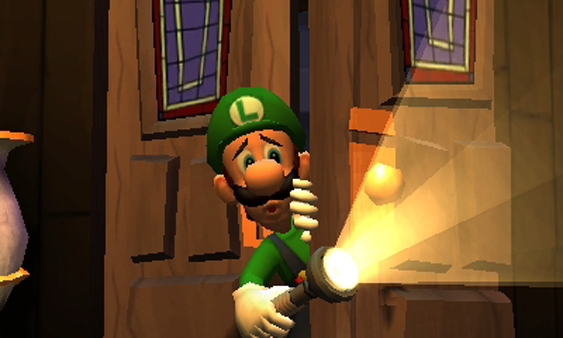 Luigi’s Mansion: Dark Moon served as Luigi’s return to the spotlight, in the sequel to the game that removed the green-clad plumber from Mario’s shadow. This time Luigi tackled the 3DS, giving the handheld another highlight in its impressive library. Luigi’s Mansion: Dark Moon follows the same fundamentals as its predecessor. Luigi traverses haunted mansions, and uses a vacuum cleaner to rid the houses of the many ghosts that inhabit them. Luigi’s flashlight now has a strobe ability, an mechanic performed by holding the action button down before releasing, with the resulting strobe light stunning ghosts. This ‘stun’ is required before Luigi can capture the game’s many spooks. The flashlight also includes a new “Darklight” device, which reveals hidden objects and exposes invisible foes. The biggest difference between the original game and this sequel isn’t in any particular gameplay feature, but the structure of the game itself. The GameCube original had Luigi searching through his own mansion to rid it of ghosts while in search of a missing Mario. It was a short, explorative experience. In Dark Moon, a returning Professor E. Gadd sends Luigi to five different mansions, each of which are split into various missions. 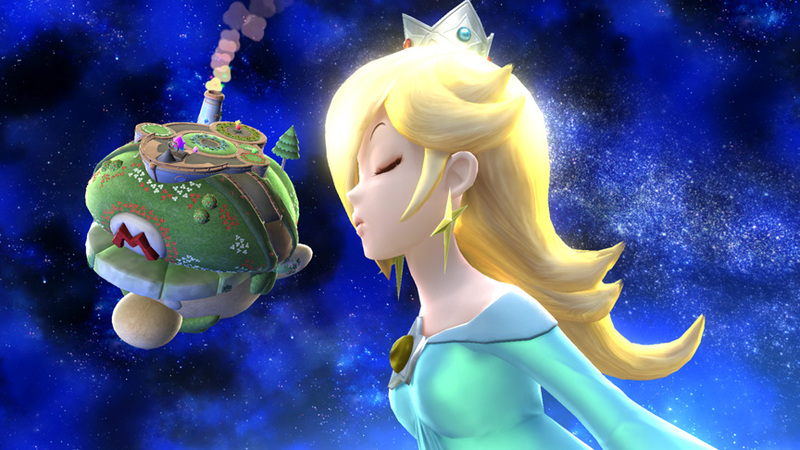 The new structure of the game allows for a greater sense of variety in level design, with the different mansions having their own little motif (greenhouse, clock factory, and so forth), and each mission housing a variety of puzzles that require more robust thinking on the many uses of Luigi’s Poltergust 5000 vacuum. Some puzzles can get a little head-scratching, but that only means they provide a bigger sense of accomplishment when completed. 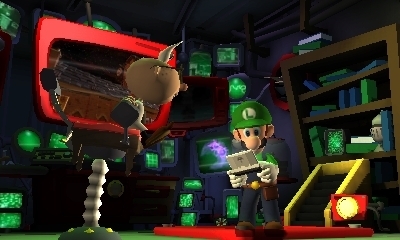 The new structure ensures that Luigi’s Mansion: Dark Moon is considerably lengthier than its predecessor, but at the same time, it also creates one of the game’s drawbacks. The first Luigi’s Mansion had a great sense of exploration, you wanted to search every nook and cranny of the mansion in the original (and you could, if you so chose). But within Dark Moon’s missions is a set objective, with many of the rooms in any given mansion being sealed off, lest the current objective requires them. There are hidden treasures that require some thorough inspecting to find, but it’s a small little sidequest that can’t quite bring back the freedom of exploration the original game had. Despite popular belief to the contrary, a game having a more linear structure isn’t an innate problem, but the fact that Luigi is whisked out of a mansion every time you complete your current mission does create a longing for the original game’s pacing. Fans of the GameCube original will also miss said game’s atmosphere. The portrait ghosts of Luigi’s Mansion were always on the cartoony side, yet they helped build a personality and presence to the original game that gave the titular mansion a strong sense of place. The portrait ghosts of old (or any other of the original game’s spectres, other than Boos) are nowhere to be found. While many of the enemies, sub-bosses, and big bosses of Dark Moon certainly do provide their own puzzles and challenges to overcome, they fail to capture that same sense of personality and atmosphere that the original game was abundant in. With all this said, these are quibbles in an otherwise well-constructed title. Dark Moon takes many elements that made the original Luigi’s Mansion memorable, makes the quest lengthier, and creates a new layer of depth to the gameplay. To add a cherry on top, Dark Moon even includes a multiplayer option. The “Scarescraper” serves as Dark Moon’s cooperative multiplayer mode, which can be played online and includes three different modes of play: Hunter mode sees each player (all of whom play as variously-colored Luigi’s) ascend further up the mansion by clearing each individual floor of all its ghosts. 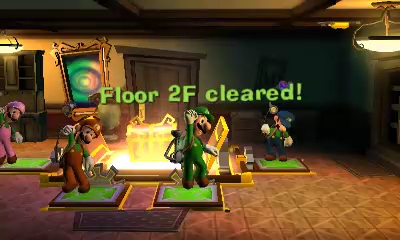 Rush mode gives the Luigi’s a limited amount of time to find each floor’s exit, with clocks strewn about – or rewarded for taking out ghosts – to give the team a little more time. Lastly, Polterpup has players scurrying about the mansion to find the titular ghostly dogs by using the Darklight. Although the number of multiplayer modes are limited, the challenge and replayability they provide are among the game’s strongest assets. Long after you finish the story mode, you’ll be coming back to the Scarescraper to see just how far you can get. Developed by Next Level games (Mario Strikers, Wii’s Punch-Out!! ), Nintendo permitted this long-awaited sequel to very capable hands. The end result is both fun and nostalgic, with tight gameplay, solid structure and pacing, and a surprisingly engaging multiplayer option. It may not evoke the same experience as the GameCube original, but Luigi’s Mansion: Dark Moon remains a wonderful piece of game design nonetheless. There may have been a twelve-year gap between the original Luigi’s Mansion and Dark Moon, but time hasn’t slowed Luigi down one bit when it comes to pure fun. It seems Big Hero 6’s Oscar win for Best Animated Feature has been met with a lukewarm reception. While most agree that it’s a good movie, it seems a lot of people are still boohooing at the snubbing of The Lego Movie, or claiming that How to Train Your Dragon 2 “should have” won. I find this to be grossly unfair, because while I personally think The Tale of the Princess Kaguya was the most deserving winner (I named it as my favorite film of 2014), I have no qualms with Big Hero 6 taking home the gold. Big Hero 6 is a wonderful movie, and a more worthy winner of the Best Animated Feature Oscar than a number of past recipients. Again, I was primarily rooting for Princess Kaguya (heaven knows Isao Takahata is well overdue for an Oscar), but I still consider Big Hero 6 to be one of 2014’s best films – animated or otherwise – and it follows Frozen’s lead in adding more character development into Disney’s filmmaking process. As far as I’m concerned, it told a better story than The Lego Movie or How to Train Your Dragon 2. I’m pretty much the only person out there who didn’t care for The Lego Movie, as I found it overly snarky and more than a little bit full of itself. Not to mention it followed just about every trope it so readily mocked. Suffice to say I didn’t lose any sleep over its snubbing. Meanwhile, How to Train Your Dragon 2, while good, suffered from the same overly-predictable nature of the first film in the series. It did boast one daring creative decision in killing off a character who appeared in both films, which gave the film some emotional weight, but otherwise the story went pretty much everywhere you expected it to at every turn (the entirely uninteresting villain didn’t help, either). Big Hero 6 did have its own predictable elements, with a plot twist involving its villain being a bit obvious. But when we find out the villain’s motivation, he suddenly becomes a more complex and interesting character who adds something extra to the story. By comparison, Dragon 2’s villain could be summed up as “I’m evil because reasons.” Although some of the supporting cast in Big Hero 6 could have done with some more fleshing out, they at least aren’t dictated by a singular punchline like those in Dragon 2. But I’m not writing this to wag fingers at Legos and Dragons, I’m writing this because Big Hero 6 is a worthy Best Animated Feature winner that doesn’t seem to be getting its due. Some have cried foul that Disney has won the award too often, though Big Hero 6 is technically only the second Disney film to win the award in question. It is true that Pixar (Disney’s subsidiary) has won the award seven times (that’s half of the award’s 14-year history), which seems a bit iffy. I myself am a believer in making exception for the exceptional, but Pixar is far from the only studio capable of producing exceptional animated films, and some of their victories have seemed far too easy (don’t get me started on Brave’s undeserved win). But Disney and Pixar are two separate creative entities, with different artists and filmmakers between them. You can’t claim that Disney’s second win is “too many” because Pixar has been handed the award a few too many times. Again I’m a bit sidetracked. My point is that most people who are complaining about Big Hero 6’s win are basing their arguments on things besides the film itself. It’s been either “X-film should have won” or “Disney’s won too many times.” No one is taking into account that maybe Big Hero 6 is just a great movie. Which it is. Hiro Hamada and Baymax are two of the most endearing of all Disney characters, and their relationship is one of the more unique in the Disney canon. Big Hero 6 becomes the story of Hiro coping with the death of his brother Tadashi. At first Hiro becomes depressed, then vengeful, before finally learning to live with his brother’s memory in his heart. Hiro learns to deal with the loss of his brother through his brother’s creation. There’s something really touching about this setup of a boy and his (brother’s) robot. Big Hero 6 deals with loss in a meaningful way, without it simply feeling like a means to capture that token “sad moment” like a lot of today’s animated films. On top of that, we also get a fun super hero story that outdoes most of the Marvel Cinematic Universe. Simply put, Big Hero 6 is a film that combines a genuinely heartfelt narrative with top-notch blockbuster elements. I’ve seen the film multiple times now, and I’ve only enjoyed it more with subsequent viewings. Big Hero 6 is simply a great showcase of animated filmmaking and storytelling that ranks as one of Disney’s best animated features. 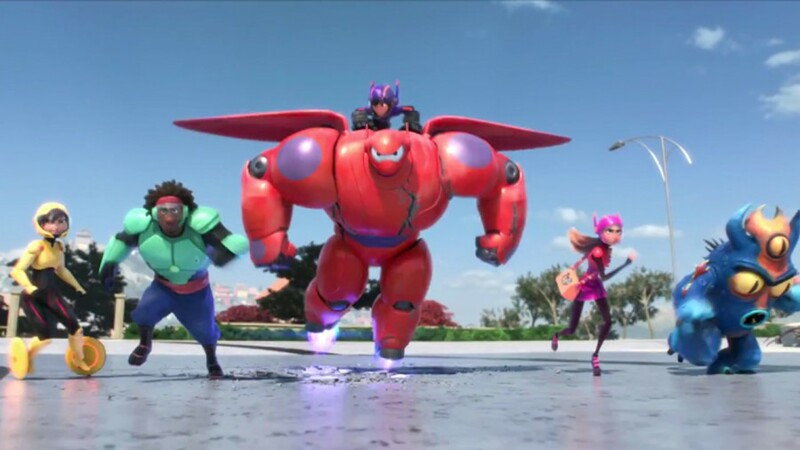 Of course, Big Hero 6 is no Spirited Away, The Incredibles or Frozen, but it is a worthy film to carry on their torch. It’s heartwarming, smartly-written, and a whole lot of fun. It’s an incredibly easy movie to love, and one that I’m happy to see win Best Animated Feature. Here you can find all of my 2015 Video Game Awards (celebrating the best of 2014) in one convenient place. A game’s graphics are often the first aspect to get noticed. Before we play games, we often have screenshots and videos to get us hyped. Naturally, it’s the visuals that almost always catch our eye immediately. Oftentimes it’s the games with the most photorealistic graphics that get all the praise. But I tend to prefer games with unique visual styles over something that merely looks “realistic.” The Ni no Kunis, Wind Wakers and Okamis. The Neverhoods and the Kirby’s Epic Yarns. Here’s a game that deserves credit for its visual beauty. There are probably two things you’ll instantly notice about Guilty Gear Xrd -SIGN-: One of those things is the incomprehensible title (seriously, what is an Xrd? ), the other is the beautiful cel-shading. 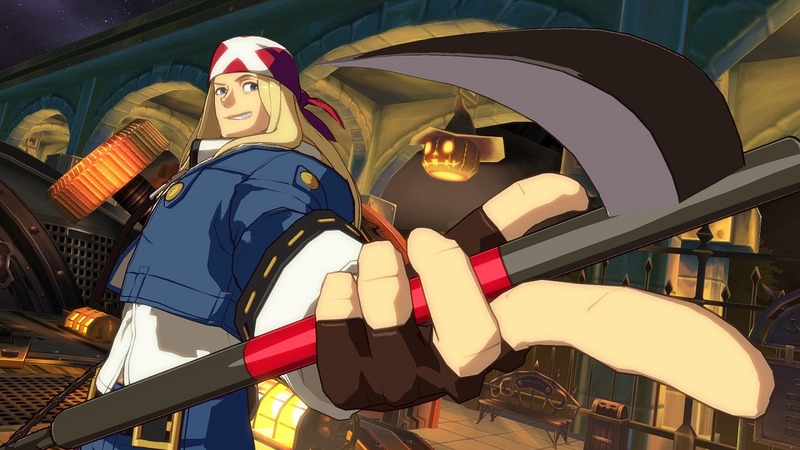 Guilty Gear Xrd -SIGN- boasts some of the most stunning cel shading I’ve ever seen. The characters look like fully three-dimensional anime characters as opposed to polygonal recreations. No ridiculously thick outlines or other such tricks to make the characters look more like anime drawings brought to the world of gaming. They actually look like hand-drawn characters that have become three-dimensional. It’s gorgeous. Funny thing is, this was kind of a last minute game I just found out about towards the very end of 2014. But as soon as I saw it, I fell in love with these visuals. I hope other developers can find ways to replicate what Guilty Gear Xrd -SIGN- has done with its animations. They’re just too good.